It's described as 'when at rest closely resembles a broken Birch twig '. It's called Buff Tip ( about 30 mm long ). Don't know how this one gets its name - it's called a Bee Moth. greg wrote: Poplar Hawkmoth. A member of the Hawk moth family. Every year I manage to get one of these friendly giants. This one has a wing span of just under 3 inches. Got the Moth traps out last night and this morning there were hundreds in it! It was moth heaven for a juvenile robin who circled the area where I was hiding them. The Yellow Underwings were everywhere. They must have had a party last night ! 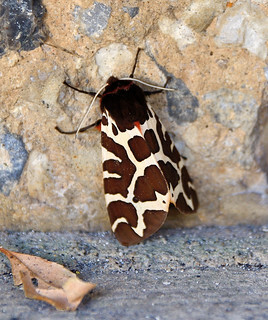 This is a Garden Tiger - never knew we had moths like this and never seen one before. I've never caught a Garden Tiger moth. They're on my wish list though ! When I was a lad I found a hairy caterpillar wandering around my garden and decided it would be fun(for me not the caterpillar) to keep it in and old sweet jar. I dutifully fed it cabbage leaves and in due course it turned into a chrysalis. I forget now how long I had to wait for the chrysalis to hatch but eventually it did to reveal a Garden Tiger. Result one very happy dirty kneed schoolboy. When I was trying to identify it the description said it was the most common 'hairy' caterpillar.